My sister and I headed to Ride at Wyboston Lakes last Saturday to give the Aqua Park a go. I am not going to lie Saturday was not a great day in the weather sense, it was windy, pretty chilly and not what the weather man had predicted. However us being the kind of people who will give anything a go still braved it and put on our wetsuits. 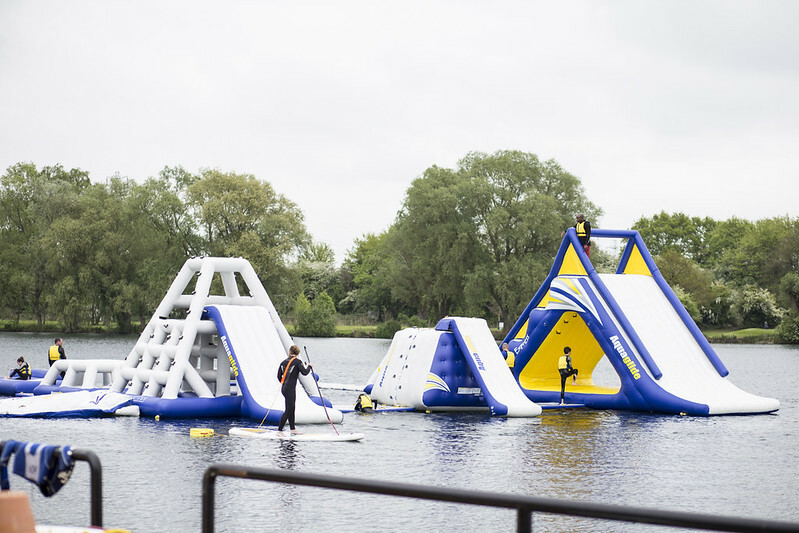 If you are thinking about giving this a go over the summer it is £15 for an hours access onto the Aqua Park, you can also hire wetsuits for £5 which I would highly recommend you do. Unless we have some kind of heat wave on the day you are visiting. It was blooming freezing. The first jump up in was quite a big shock for us, we knew it was going to be cold but it was on the level of the ice tank things you could jump in at Centre Parcs (if you ever been in one of those). However the more time you spent in the water the warmer it became and the wetsuit helps keep some warmth in. 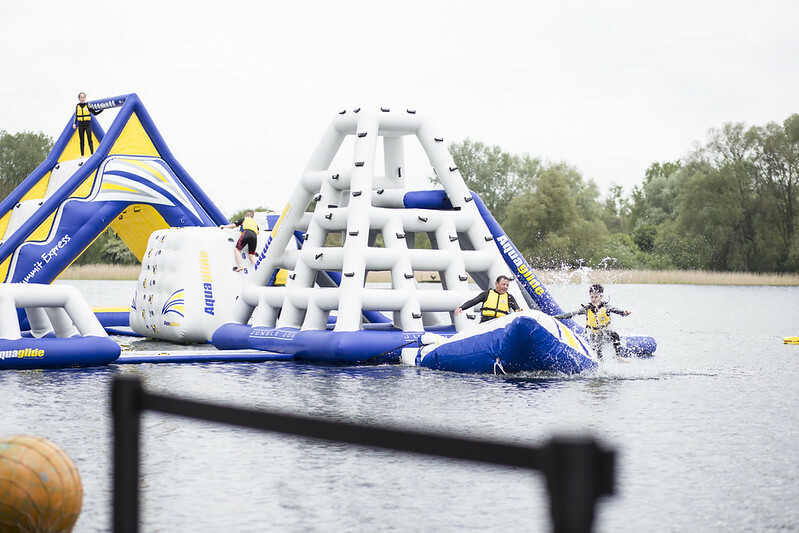 There is an additional piece coming to the Aqua Park which hadn't arrive in time for our visit. It sounds a bit like a water round bouncy castle. The actual elements within the park are really tiring so an hour is more then enough to be honest. I fell over about twenty times, I have come to the conclusion I just have no balance. It was pretty funny though but I am still gutted I missed the only time my sister fell over. If you are interested in doing this over the summer then check out the Wyboston Lakes website page on it here. 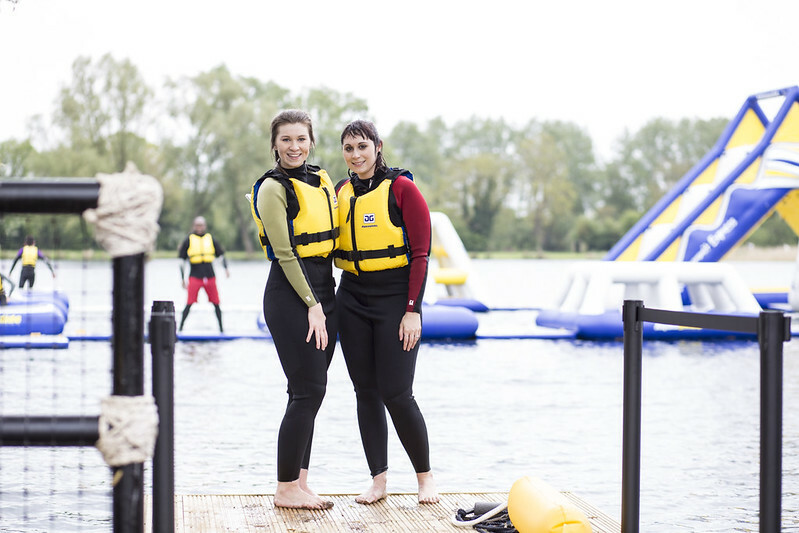 Those there are not local Wyboston Lakes is based in the Cambridgeshire area and is great not just for the Aqua Park but also their restaurant and spa facilities too, check our my post on Y-Spa here if you haven't already. I did actually vlog the day (semi vlogged, there a couple of few second clips of me talking to the camera, it's a start ha) check out the video below and if you like it don't forget to subscribe to my YouTube channel. I was not paid for this post but visited the aqua park for free for their soft launch, all views and opinions of my experience are my own. Thank you so much to Wyboston Lakes for inviting me.